Robert Schneider, MD, FACC, Dean of MUM’s College of Integrative Medicine, will provide a sneak preview of his upcoming book on the subject, Super Aging, and explain how to discover your Aging IQ: The Four Pillars of Anti-Aging that you can immediately put into practice to enhance your well-being, vitality, and youthfulness. We will compare the Maharishi AyurVeda® approach to wellness with the ancient system of Greek medicine exemplified by Hippocrates, who is considered the Father of Modern Medicine. We’ll explore how ancient Greek medicine shares key principles with Ayurveda, including a holistic mind-body approach with an emphasis on lifestyle. And we’ll see how modern science validates this timeless approach. As a participant, you’ll learn practical strategies for optimal aging uniquely based on your individual mind-body type. You’ll discover the role that your mind-body type, nutrition, exercise, sleep, a healthy mind, digestion, environment and social interaction all play in longevity, according to the latest breakthroughs in the field. You’ll get practical advice on diet, nutrition, daily routine and happiness-promoting behaviors personalized just for you. Group instruction in easy-to- practice Maharishi YogaSM asanas. These gentle mind/body programs are effective in helping to remove surface stress and strain, smoothing the way to deeper TM practice. 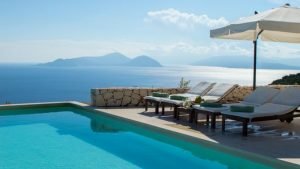 Opportunity for hiking, walking by the sea and swimming in the private pools found at each of the residency villas, all of which feature stunning views of the crystal blue Ionian Sea. Three healthy and sumptuous group meals, plus snacks every day, lovingly prepared from locally sourced, fresh produce. Enhancing the relaxing atmosphere: we will be staying at the Urania Luxury Villas. 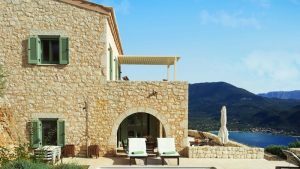 The five villas at Urania feature all the conveniences of modern living in an elegant, timeless atmosphere, with private swimming pools and exceptional views of the Ionian Sea from every room. Single and double rooms are available, each with private baths. Course participants will keep a journal of their experiences during their visit, charting their individual journey to optimal health and anti-aging. Professor Dorothy Rompalske of MUM’s David Lynch MFA in Screenwriting program will guide students in effortless journaling techniques, as they explore the links between creative self-expression and wellness. Excursions to local sites of ancient Greek culture will highlight the contributions of ancient Greece to holistic health and mind-body well-being. The ruins of the ancient Greek Temple of Apollo who, according to myth, was the god who protected doctors and was the father of the first Greek physician, Asclepius. The site boasts stunning views of the lighthouse of Akrotiri and Cape Lefkata. Breathtaking Porto Kasiki Beach, routinely found on the lists of the world’s most beautiful beaches for its turquoise waters, golden sands and dramatic cliffside setting. Axerontas River, one of the most inviting and magical sites in Greece. According to myth, it was on this river that Hades transported the souls of the departed to the Afterlife. Legend also has it that a dip in its cool waters grants the bather immortality! This is a two-credit course at Maharishi University of Management. The only pre-requisite is that course participants must currently practice Transcendental Meditation, or learn the technique at a local TM Center before the course starts. Checking will be provided to those who would like to refresh their meditation practice. Students are asked to purchase and bring with them the textbook for the course, Robert Schneider’s Total Heart Health: How to Prevent and Reverse Heart Disease with the Maharishi Vedic Approach to Health, published by Basic Health Publications, which is available at the MUM University Store or www.totalhearthealth.info or Amazon.com. will rendezvous at the bus station in Athens on April 27, 2018, for a scenic ride bus together to Lefkada. To join us for this unique opportunity to relax, rejuvenate and learn ways to improve your health for years to come, please apply by January 21, 2018. Places are limited, so apply early. We will accept applications in the order in which we receive them and get back to you in mid-January to confirm that your application has been accepted. Note: A $500 non-refundable deposit is required upon acceptance of your application. Since places are limited, priority will be given in the order that security deposits are received. Please note that 50% of the course fee must be paid by February 1, 2018, with the remaining 50% (minus the security deposit) due by March 31. Pay in person at the MUM Student Accounts Office located in the Enrollment Center in the basement of the Dreier Building, using a credit card or a check made payable to Maharishi University of Management. Mail a check to the MUM Student Accounts Office, 1000 N 4th St., Fairfield, Iowa, 52557. Transportation to the city of Athens, including airfare. Personal tips to the staff at the resort. Costs of any excursions taken beyond those offered as part of the course. Optional personal services available locally, including massage.